You have spent a lot of time designing Custom Menus and Toolbars in your .MDB Database. You have upgraded to Microsoft Access 2007 Version. You opened your .MDB database in the new version of MS-Access. 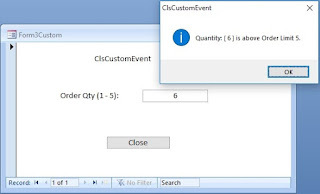 The customized menus and toolbars you have designed for your application are disappeared. Your Custom Menus and Tool Bars are not gone anywhere, all you have to do is to find them. Custom Menus and Toolbars are safely kept inside the Add-in Menu of Microsoft Access2007. Click on the Add-in Menu to find all of them there. Check the sample image given below for reference. Have you noticed the group name Custom Toolbars appearing at the bottom of the Add-in Menu? But, Access 2007 Menu Bars also appearing on the top. 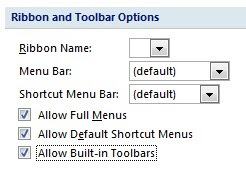 You want to turn off the default Access2007 Menus and Toolbars from the top and replace it with your Custom Menus and Toolbars. Click on the Office Button (Top left corner). Move the scrollbar down to find the Ribbon and Toolbar Options as shown on the image given above. Select your Custom Menu Bar name from the drop-down list, replacing the text (Default). Select your Shortcut Menu Bar name from the drop-down list replacing the text (Default). Click OK to save changes and come out of Access Options. Close the database and open it again to register the changes. 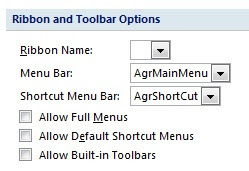 Now, your Menu Bars and Tool Bars are in complete control of your Application they will look like the image given above. You want to restore Access 2007 Menus and Toolbars, then open .MDB file by holding the Shift-Key, to prevent Auto-Macro from running and to get control of the database window. Go through Steps-1 to Step-9 and reverse what you did earlier.